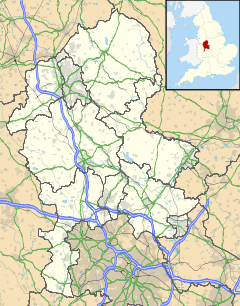 Betley is a village and civil parish in the Newcastle district of Staffordshire, England, about halfway between Newcastle-under-Lyme and Nantwich. Betley forms a continual linear settlement with Wrinehill. Betley lies on the A531 from Madeley to Weston. There is an hourly bus service, run by D&G Bus (route 85 ) which runs through Betley from Hanley and Newcastle-under-Lyme to Crewe and Nantwich. Betley - meaning the 'clearing in the woods' of Bette (a Saxon woman's name) - is an ancient settlement. It is mentioned in the Domesday Book. It is one of several villages - including Buddileigh, Audley, and Madeley - which seem to be named after women. It had a major market, the charter for which was granted in the thirteenth century. At Betley Hall, a now-demolished country house, Charles Darwin conducted some of his zoological observations and Florence Nightingale visited. At another country house in the village, Betley Court (which is still standing), lived the Romantic poet Elizabeth Tollet. The church, dedicated to St Margaret of Antioch, is a beautiful medieval building (reasonably well-restored by George Gilbert Scott), with oak beams and a cricket ground to the rear. ^ "Parish population 2011". Retrieved 30 May 2015. Betley: A Village of Contrasts, ed. Robert Speake (Keele University, 1980). Wikimedia Commons has media related to Betley. This page was last edited on 7 October 2018, at 11:50 (UTC).